Literally. There is a whole new batch of books about the Moomins, and I’ve ‘read’ two. I quite liked the board book Moomin’s little book of Numbers. It’s bright red, and I’m not sure why that helps, but it looks very cheerful. It’s just about learning the numbers from one to ten, and there are obviously loads of such books, but it’s nice to have the Moomin pictures. The second book is Moomin and the Birthday Button, which is basically a picture book about how his friends seem to have forgotten Moomin’s birthday. It’s a sweet little story, but it feels like I’ve come across the same plot countless of times in other books. That doesn’t mean that a new generation of prospective Moomin lovers won’t enjoy it. I’m sure they will. The slight feeling of unease that I’m experiencing is because I’m not sure if it’s all right to produce new Moomin books now that Tove Jansson is dead. I’d like to know who has ‘written’ them, and who made the pictures. It only says based on the characters created by Tove Jansson. The copyright is with the Moomin ‘company’, which is only to be expected. What I don’t know is if these are exclusively Puffin’s books. I went hunting online, and found an article from Finland earlier this year. It seems that the contract with Puffin for ten new books is the largest they’ve ever had in Finland. I take that to mean in publishing or even in children’s publishing, rather than in business in general. But it’s clearly very good, and I can see why you don’t turn down something like this. But then I’d rather have a new generation discovering Moomin, than Disney books. 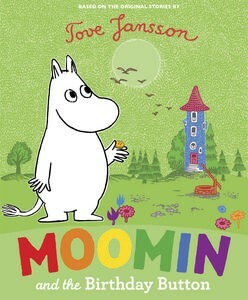 It will be older Moomin fans who buy for their children or grandchildren. On account of us (that’s Daughter and I) setting off for Oxford later today, I’ll ponder the business of writing really clever stuff. For some obscure reason the previously mentioned Daughter started asking questions about dissertations the other week. And to be perfectly honest I’m not sure of the finer differences between things. My educational background never stretched further than essays. Or possibly it did, and I’m just incorrectly using the word essay for my humble efforts. I wrote a dreadful thing on the American space programme, but the poor physics teacher was impressed. It didn’t take me long at all to work out what a feeble piece it was. It taught me the valuable lesson that sometimes the hardest thing is to write about what you love. So later on at university I simply picked a topic off the tutor’s list and ended up with Under Milk Wood, of all subjects. But it was OK, and I enjoyed it. At the next stage I went for The Angry Young Men, which was less fun, but still interesting. On the other hand, I won’t be sorry if I never read another play by John Osborne. I would much have preferred Tom Stoppard, but apparently he was too fluffy and fun to take seriously. Needless to say the Resident IT Consultant did stuff on IT kinds of things. I’ve never bothered reading it. And I couldn’t find a copy when I was going to show Daughter how clever her old people once were. As I was busy flipping out with the effort of having two small Offspring at home, I met someone at one of our Swedish meetings, who taught at the university. She spent the first two years of her first child’s life polishing her PhD, while also effortlessly giving birth to child number two. In fact, I got the impression that for each child (she has four) she spent the maternity period on something academic. I did try to read her thesis. She was actually very pleased when I inquired about it, and provided me with a copy. As I dug it out for Daughter’s investigation I noticed that I hadn’t even got halfway. It was sort of in my kind of subject, it being linguistics, but I still didn’t understand the finer points of Swedish noun phrases. So I don’t know. Might be best if I stick with low-level blogging. Monsters of Men is – of course – the book I was referring to in a comment last week. Spectacular was the word I used, and I was pointing out that whereas The Knife of Never Letting Go is a very good book, Patrick Ness has improved with each instalment of the Chaos Walking trilogy. The Ask and the Answer definitely deserved the awards it was given, and the mind boggles when I think about what Monsters of Men ought to get. At the end of book one I was dismayed to find that there was very little reprieve for Todd and Viola after all they had come through. I was more resigned in book two, but could see that there just might be light at the end of the tunnel. Some way into Monsters of Men I felt it was not at all unlikely that it would end in disaster, but what was more, for someone who craves happy endings, I didn’t mind. I came to the conclusion that if this was heading straight to hell, then it was a most interesting journey and well worth reading. Having seen life through two pairs of eyes in the other two books, here we get a third point of view with 1017 as a counter balance to Todd and Viola. There is more symmetry in that they have a ‘mentor’ each, and these mentors have a lot more in common with each other than you’d think. There is some good in them. Yes, even in the Mayor. And there is bad in all. You come to see that this is often the case in many scenarios, and there are countless parallels in real life. Good and bad come together. I toyed with the idea that the Mayor would turn out to be good for a long time. You don’t think he will, but there are many little signs of good. Mistress Coyle is not as good as we girls would prefer her to be. And The Sky has a lot going for him. But maybe he’s not perfect either? And what about the young people they train to do their jobs? Are they special? This is such an interesting way to look at what people do. And there’s a lot of background to wars in general, showing us how easily and how often everything will go as wrong as it possibly can. The horses are the real heroes. And for all who hated Patrick for killing off Manchee the dog, he does something to almost redeem that. And then he does something else to make you despair. It’s all very human. Or Spackle. Or whatever. Despite this complete lack of interest I have in that ridiculous competition taking place in South Africa at the moment, it has made me read about football. Keeper by Mal Peet has had a bit of a wait here at Witch Towers, but it proved to be just as good, if not better than expected, once I actually got to it. Keeper is a rather symbolic title when you know what it’s about. The main story is about El Gato, the goalie for Mal Peet’s imaginary South American national team, and they have just won the World Cup. He’s being interviewed by Paul Faustino for tomorrow’s newspaper, but the interview doesn’t go quite as Paul had thought it would. El Gato has his own agenda. With the actual cup on the table between them, they have a very long conversation about El Gato’s past and how he came to be a goalie in the first place. It’s both an interesting journey he has made from his humble beginnings, and an inspiration. The end is enough to make you both cry and smile at the same time. I’d go so far as to say that Keeper is more a novel for non-soccer-mad people than for fans, but I’ve been known to be wrong before. And who could have imagined there were so many clever skills to learn to keep goals well? If I’m not careful I could end up having respect for the sport. Mal’s foreword mentions how football can open doors when you travel. He’s probably right there, too. When things look dark and I have to try and explain to Swedes, yet again, that I live in Stockport, I sometimes get a glimmer of light when someone says ‘Stockport County?’ and I can say yes. The man responsible for sweeping our non-existent chimney over there is well versed in the lesser teams of English soccer. The prodigal Son looked at the kitchen calendar when he returned from his long exile, and said that he thought that was a very good photo of Adèle Geras. Especially the nail coming out of her head. And I suppose it’s true that the nail and the photo are more closely connected than you’d otherwise expect. I’m sure it doesn’t hurt. Or not too much. Tickets for the Edinburgh International Book Festival go on sale today, which reminds me that I haven’t even looked at what I want to do yet. Must get round to it. Must. I don’t believe I sat down and predicted anything for the Carnegie this year. The shortlist was good, and I’d have been happy for any one to be the winner. Neil Gaiman has now won rather a lot of awards for The Graveyard Book, and he seems to be the kind of author who gets more negative responses for a win than most others. He needn’t be everyone’s cup of tea, and in most cases it’s never about the writer anyway. And in my mind The Graveyard Book is marvellous enough to merit winning, even if it’s not always ‘fair’, and even though I’d have been very happy to see one of the others win instead. It’s the Lancashire Book of the Year today, so hopefully Preston Town Hall is yet again full of young readers and shortlisted authors, presided over by Adèle Geras, among others. Swedish media have thought of nothing but The Wedding for a long time. Crown Princess Victoria got married last Saturday, and I hope she’ll be happy with her Prince Daniel. Some of the discussions on the internet reminded me of what Philip Pullman said about Victoria, after he met her five years ago. He felt she’s just like a Princess ought to be, if there are to be princesses. I’d have linked to his piece here, except with the revamped website, I believe Philip’s old newsletters disappeared. Finally! 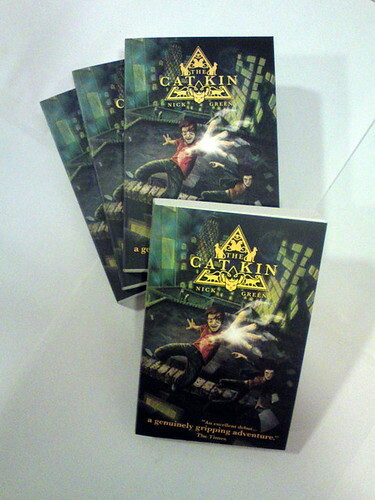 I have a copy of the new version of The Cat Kin in my hands (and aren’t you impressed that I can type and hold a book at the same time?) Whereas I did like the old cover, I must agree with Nick Green himself, and everyone else that the new cover image is so much more suited to the story. You can virtually see that the children have become cats, and you can see the action they get involved in. It looks exciting, and you have the place made obvious with the Gherkin in the background. On four hours of sleep the witch went to Birmingham yesterday to show Daughter the splendours of the university. I walked through the university area last year, on my way to the Campaign for the Book conference, so I was practically an old hand at this. Those nice physicists had cups of tea on offer to visitors, and I have to admit to having had three. Cups, that is. It was purely with a view to staying awake a little longer. The amount of chewing gum stuck to the undersides of tables was impressive. You could admire this in comfort, without first falling off chairs, because some surplus tables had been left upside-down. But you would think that with all that knowledge of physics they could work out that one small bin would never suffice for all the tea and coffee debris. I spent a long time on the chair I never fell off, as I didn’t want to risk snoring my way through the talks. So I planted myself in the refreshments room with a novel, which I read until I experimented by closing my eyes somewhat. The DVD on a loop, which described the advantages of studying physics at Birmingham probably played ten times, at least, and I could recite, almost verbatim, what people said. But I won’t. One second year student thought his first year there was the best of his life, with all the great things that happened to him. That was until the second year, which was wonderfuller still. Or you could go and get a job on the Mars Express in Germany. On the physics ‘market stalls’ we saw a pig that wasn’t there. It was a sweet little thing. All pink and shiny. But it wasn’t actually there. Daughter stroked empty air. Education is a wonderful invention. The whole visit was very pleasant, with possible exception for smell of barbecued, dead animals, which they sold to people for lunch. Also stall selling fruit and veg on steroids, judging by their size. And among things overheard was the former ‘professional drowner’ talking about her past job. Excepting my own personal excellence (cough), I have to disagree with the member of staff who said that going to Scandinavia for a year abroad will be very easy because everything’s done in English over there. Some of it is. But not always terribly well. I did fine with my reading, despite the lack of sleep, and now have only a few pages to go. Daughter finished her Stravaganza, and was most satisfied with the romantic ending of book three. They really are going to get married. At last. 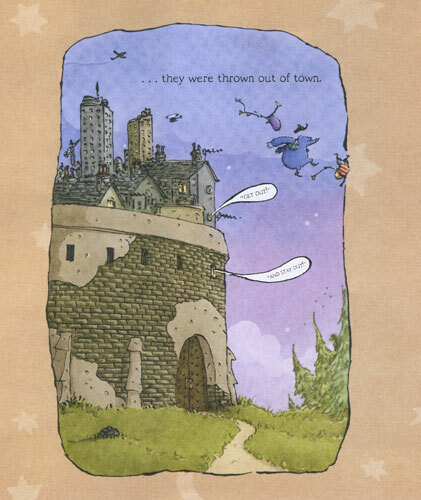 I read this new picture book by Joel Stewart in spite of myself. I just meant to have a quick look through. I really did. But Dexter Bexley and his pal the Big Blue Beastie hooted so noisily that I was caught. The title Dexter Bexley and the Big Blue Beastie on the Road is an awfully large mouthful, but quite appealing nevertheless. It’s about making too much noise, and about the silly Sir Percy Pecket and his beloved Princess Philippina. They hoot so much that they end up in the entertainment business. And as we all know, that can be tiring. Now that I think about it, I’d say this book may be a subversive attempt to get small children to fall asleep. Very clever idea.